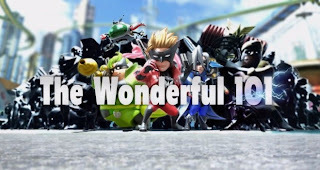 Out of all the games I played at the Wii U Experience, Platinum Games ‘The Wonderful 101’ was the most intriguing to me and was my first destination at the event. At the kiosk I was handed the controller and greeted with an intimidating control scheme screen. I can’t stand these kinds of things but it is understandable in a demo. The demo throws you right into the game and gets the battle rolling. 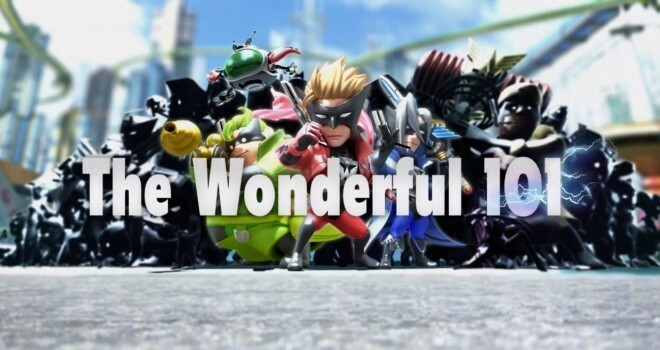 There are a few things to understand about the core mechanics of The Wonderful 101. Your playable character is actually made up of several, even dozens of characters. On the screen it looks like you are controlling a heard of Pikmin even. You have your standard health bar at the top corner of the left hand side of the screen but under that you have a row of battery icons. These batteries fill up when you use your standard attack dubbed the ‘team attack’. When these batteries are filled you can use your special attacks which combine the power of all your heroes on screen into a giant gun, sword or fist. These special attack modes are triggered by drawing certain shapes on the Wii U gamepad. The gun sounds like the coolest of the weapons but it can be a bit finicky to use. You constantly have to rotate the gun around to face your enemy and it takes a lot of time. However when a hit lands it does massive damage. The giant fist is a bit easier to maneuver but is only effective at close range. My favorite of the three weapons though would have to be the sword. With the sword you can strike at close and far ranges, it is very easy to maneuver and change the direction of your attacks and it is just really satisfying to beat the nuts and bolts out of these mechanical monsters with a huge sword. I think using the sword comes at the cost of some attack strength, but it was still my weapon of choice for the demo. The demo gives you about ten minutes to play so I powered through it as much as possible. The game is fairly linear but does give you options to sometimes go off the beaten path and find power-ups and other collectibles. The actual gameplay is fairly straightforward you progress in a particular direction and mini-bosses along with smaller enemy units appear and stop your progression until they are defeated. These bosses break down slowly and shed their armor letting you know how much damage they have taken in addition to a health bubble they have displayed on the interface. Most interestingly the game allows you to add any random npc you might see to your super hero squad; from civilians, to police and soldiers. This increases the strength of your attacks and makes your party look a bit more imposing. Eventually I made my way into a warehouse like building where the action switched to the Wii U gamepad in a third person over the shoulder view. Inside the warehouse you have to use the fist special move to turn a giant combination lock in order to complete a puzzle that requires you to see what is on the TV screen as well as the gamepad. After exiting the warehouse I ran out of demo time and had to pass the controller to the next eager player in line. While my time with the game was brief I got to experience a lot of the elements of this unique beat-em-up and it has easily moved up as one of my most anticipated Wii U titles. The game is not a launch title but is slated to be available by March 2013. Check out the most recent trailer for the game below! I am very happy seeing this video. I received a lot of positive emotions and pleasure from watching. I am glad to be supplied with such detailed descriptions, thanks a lot for sharing your wonderful impressions and bright thoughts! I like posts connected with the picture and stories. So, this blog is awesome. Thank you and good for you.